Many Wiccans celebrate Samhain on October 31st and do so in style, spending hours creating beautiful, touching, and meaningful altars. Samhain is one of eight Sabbats, observed as part of the Wheel of the Year. Samhain is a time to celebrate the lives of those who have passed on, and it often involves paying respect to family members, elders within Wicca, friends, and other loved ones who have died. Heathens celebrate Winter Nights and Ancestors Night around the same time. Winter Nights is a festival from ancient Scandinavian Heathenry which coincided with the slaughter of cattle at the beginning of winter. In the USA it is typically celebrated during late October, usually around Halloween. In modern Heathenry Winter Nights has become closely associated with the ancestors. Ancestors’ Night celebrates the ancestors and is typically celebrated around a bonfire on November 1st. Candles are lit to honor individual ancestors. Some Heathen groups dedicate this night to the ancient oral traditions of storytelling, song, poetry and riddles. Dia De los Muertos, celebrated on November 1 and 2nd, focuses on gatherings of family and friends to pray for and remember loved ones who have died. Celebrants build private altars honoring the deceased and decorate them with marigolds and the favorite foods and beverages of the departed. The origins of this holiday date back to an Aztec festival dedicated to the Goddess Mictecacihuatl. 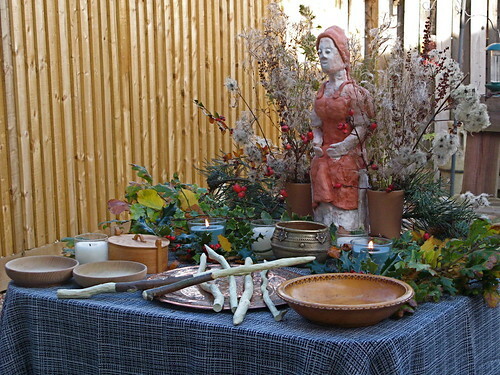 Modern Pagans, especially those of Hispanic decent or those looking to revive the indigenous religions of Mexico, have incorporated this festival into their religious practices. No matter what you are celebrating – and if we have missed your religion’s holiday let us know – PNC-Minnesota invites you to send us a photo of your altar. Tell us the meaning behind what is on your altar or what it means to you. We will display these photos on October 31st as a way to honor the festivals and those who have passed on. If you do not wish your name to be used when displaying your altar, just let us know. Send photos to schulzcaral@gmail.com.